I’m usually the one handing out recommendations when it comes time to find dinner at work. A few weeks ago, a co-worker turned the tables on me. She found a Philly Steak place not far from the station and said it was amazing. I was skeptical because I knew the place she was talking about. It used to be Sam’s Philly Steaks and I had eaten there in the past. Plus, it’s a Philly steak place not in Philly…so the goodness of it is going to be pretty subjective. Philly Steak & Cheese Express is on the corner of Eastern and Thomas and, as I mentioned, takes over the space that used to be Sam’s Philly Steaks. I don’t actually know when the switch took place. Sam’s closed quite a while ago and the windows were covered. 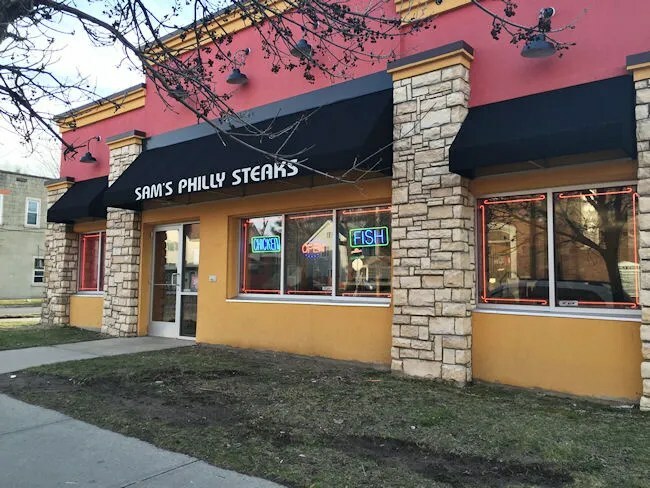 This new place didn’t actually change anything on the outside, including a sign that still says Sam’s Philly Steaks, so there’s no way I would have noticed they had reopened other than the open sign in the window. The inside of the restaurant is pretty small. There’s only a couple of tables which were being used on the day I stopped in. The bulk of the space is kitchen with an order counter separating it from the customer area. I ended up ordering the next best thing. 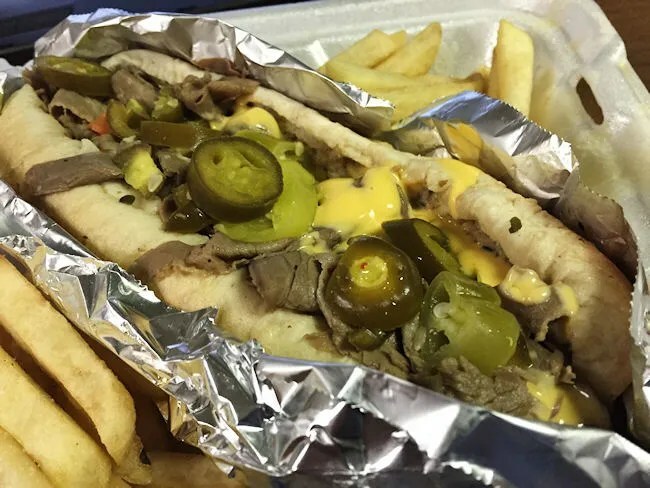 An Italian beef sandwich. 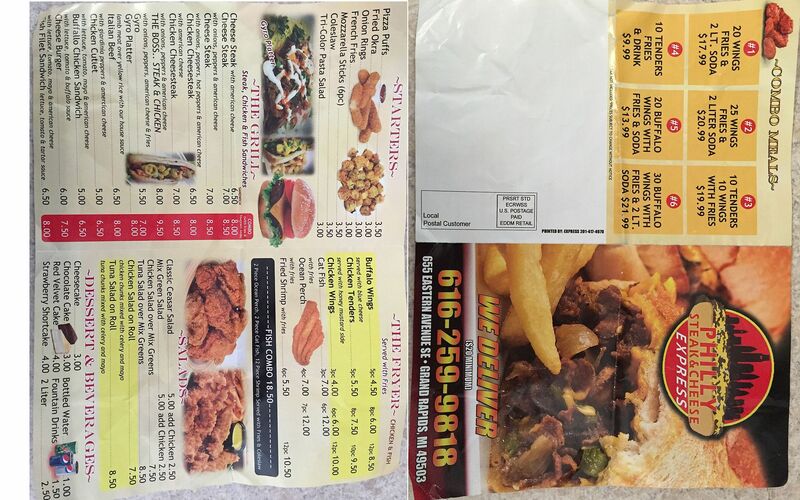 I got the combo which included fries and a Coke then added on hot peppers and cheese. The total cost came out to a little over $8. I grabbed a can of Coke out of the cooler while I was waiting for the sandwich to made. I didn’t expect them to make the beef from scratch seeing as 1.) we’re outside of Chicago and 2.) it’s not really a main menu item for them. What I saw is pretty much what I expected. A stack of beef was taken out of the freezer then dunked into some hot au jus to warm up. The sandwich was then assembled on a crusty roll and topped with the hot giardiniera and squeeze cheese. I asked for it dipped, but they just poured more of the gravy over the sandwich instead of dipping the whole thing in. It was then boxed up with the fries and handed over for me to take back to work to eat. I started in on the fries on the way back to the office. 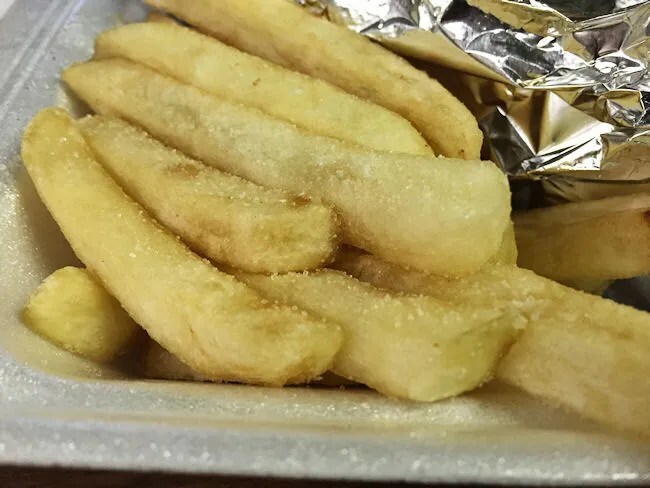 There were a lot of fries in the Styrofoam container. They were simple, out of the bag restaurant fries which were pretty heavily salted. They were really crispy on the outside and I can’t complain about the portion size as most people would have been able to eat just the fries and be satisfied. The sandwich had to wait until I got somewhere I could sit down and grab a stack of napkins. There was quite a bit of meat on the sandwich and with the squeeze cheese, it really did have the feel of a Philly Steak. The giardiniera was mostly jalapenos with a few other veggies mixed in. The sandwich was good for being outside of Chicago, but pretty much everything on the sandwich starts frozen. That’s not a bad thing, it’s just not Al’s Beef good….but then again, what is? The bun really started soaking up the juice from the beef, but it held together well and didn’t fall apart under the strain. Like the fries, the portion size was much bigger than expected and would have been enough of a meal on it’s own. 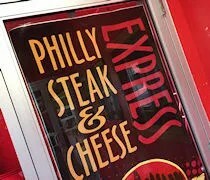 Philly Steak & Cheese Express is a pretty tasty little neighborhood sandwich joint in an area of town that doesn’t have a lot of dining options. I would compare the food to going to Philly and asking for a Coney Dog. You’re going to get something resembling what you’re used to and it’s going to taste alright, but it’s not going to be the same as what you’re used to back home. That’s how I feel about Philly Steak & Cheese Express. Good stuff, I will definitely eat there again, but it will never compare to the regional food it’s trying to emulate.